Nissan Titan pickup truck owners are the type of friends and neighbors who are always ready to lend a hand. A new purpose-driven campaign from Omnicom Group’s Zimmerman Advertising aims to celebrate those unselfish acts and to further support three philanthropic groups on a national and local level. Nissan has been focusing on its technological capabilities for the automaker’s overall brand messaging, and this effort helps humanize the “amazing” capabilities of what the truck actually does, says Jeremy Tucker, vice president, marketing communications and media, Nissan North America, Inc. They are the kind of people who not only want to get the job done, but they want to improve the world, he says. Nissan’s top challenge is to raise the awareness of the truck. The domestic pickups—Chevrolet Silverado, Ford F-150 and Fiat Chrysler’s Ram—are better known. Current Titan owners say they bought their vehicle after seeing Titans helping in the community, such as during hurricane relief efforts. “We started to realize we’ve got all these stories of the DNA of who we are and what we’ve always done, and we’ve got these partners who actually believe the same thing we’ve always believed,” Tucker says. That prompted the automaker to begin to have conversations with the various charitable groups it works with. The automaker identified three distinct segments those acts general fall into—community, neighborhood and outdoors— and partnered with three organizations rooted in serving in those areas. They are Habitat for Humanity (neighborhood), the American Red Cross (community) and the National Park Foundation (outdoors). Later this month, a series of TV spots and social media campaigns will highlight the inspirational endeavors of each nonprofit. The campaign, which will run heavily on college football alongside the brand's Heisman Trophy-related efforts, will feature the song “Whatever it Takes” from Imagine Dragon, Tucker says. 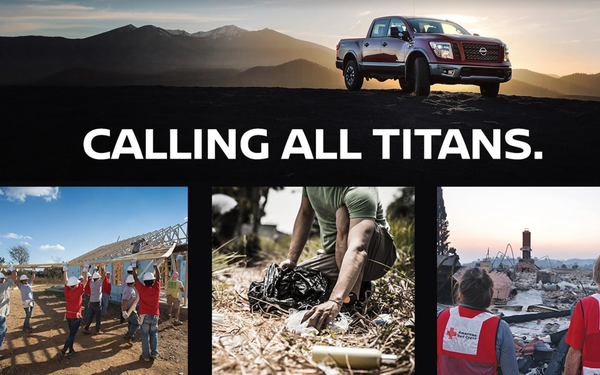 In addition to a $1 million donation to each organization, Nissan will actively promote local volunteer opportunities and ways Titan enthusiasts can get involved through a new campaign. Research shows that the majority of American (78%) believe companies must do more than just make money—they must positively impact society as well. Nissan has already been working with two of the three charitable groups, and the addition of the third — the National Park Foundation — is a natural, given Titan owners enthusiasm for the outdoors, Tucker says.